Our "Kaanapali" bamboo curtain is a little heaven on earth! 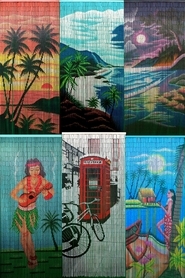 Missing Maui? Go there any day! Magnificent palm trees against a moonlit sky in outstanding colors make this a curtain you'll want to hang everywhere! Each curtain is made of the highest quality materials: 90 strands of bamboo beads individually strung on wire, linked together. The beads are hand painted on all sides and the picture is visible from all angles. The headrail is equipped with two eyelets for easy installation. Perfect for doorways, hallways or as wall hangings. 35.5" wide, 78" tall. The ShopWildThings logo is NOT on the actual curtain. Love it- just what I thought it would be. It looks great! 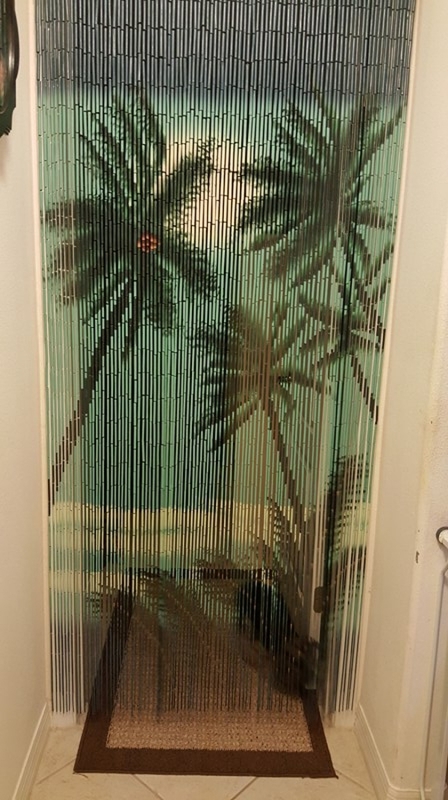 We wanted to replace the louvered door on our walk-in closet at our condo in Florida, but didn't know what to replace it with. 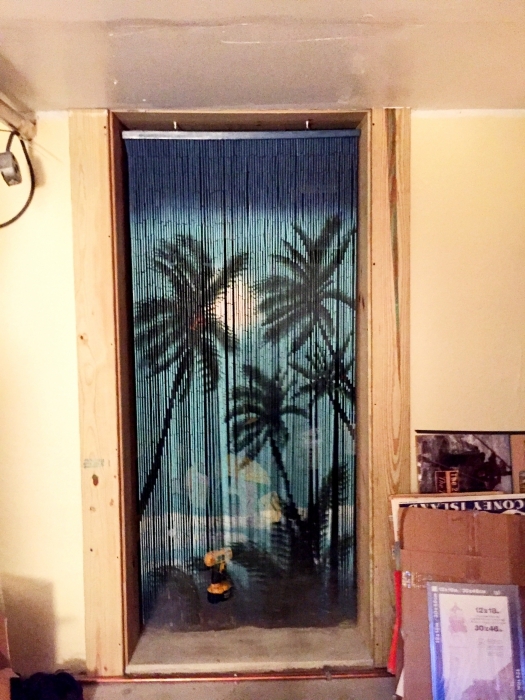 I stumbled across this website with bamboo curtains and thought it would be the perfect solution. It looks really cute, and still allows air to get through so the closet doesn't get any odor from being closed up completely when we're not there. The palm tree design and colors fit the decor of the bedroom. My one complaint is that one of the little pieces of bamboo got crushed during shipment and of course it is right smack-dab in the center, so it's somewhat noticeable that a piece is missing. I'm not sure how it will hold up because it is a bit flimsy, but right now it looks pretty cute and serves its purpose perfectly. I spotted this item in a recent issue of "Coastal Living" and tracked it down! A magazine feature showed it used to cover a closet in a home in Maui, and I thought it would also look great in our house near the beach in California. It is absolutely beautiful and looks very much like depicted. It hangs well. We have used it to cover a small entrance to a closet that we took the door off. It gives a space instant ambiance. Very pleased, and it arrived very quickly. Beautiful tropical bamboo curtain. Easy to adjust length . Arrived very quickly. Made well. I would recommend. This is just perfect. Such fast shipping too! These are so different from the normal window coverings that I have used in the past. I have these in my guest bedroom and I get lots of compliments on them. It makes my guest feel as though they are at the beach and I live about 300 miles from the beach! The curtain is very well made and the design is painted on both sides. I purchased two of these to replace the doors on my daughters closet to give her a "beach" theme. The coloring is beautiful, especially the way the fan slightly stirs them when it is on. I feel good looking at the beaded curtain. It's beautiful and gives me a little privacy. It is even cuter in person!